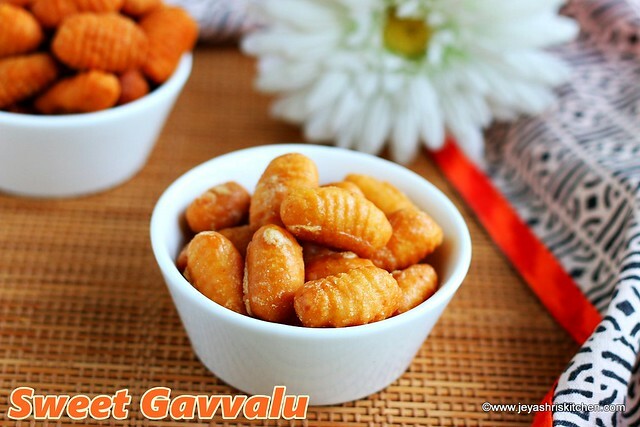 Gavvalu| kulkuls| Sweet shells| Seedakaai| Kalkals, is a Andhra style sweet, made with maida and sugar as main ingredients. Generally sweet version of Gavvalu is more popular but they make Karam gavvalus too. Traditionally they use a wooden Gavvalu maker but if not available you can use fork or new comb too. I got this recipe and the gavvalu maker from my friend Anuradha, who also shared with me some sweet gavvalu she made. I wanted to post this recipe for last year diwali itself, but finally posting for Diwali 2017. I have tried both sweet gavvalu and Karam gavvalu too. The same one Goans also make for Christmas and call this as Kulkuls. Check out my full collection of Diwali recipes. Karam Gavvalu recipe will be coming soon. * I used raw sugar, you can use jaggery or white sugar too. In a wide bowl, add the flour, sooji, salt, baking soda, hot oil and ghee. Add water little by little to make it into a dough. Let this be like a chapathi dough and not too hard. If you have time, keep it aside for 10 minutes, else go ahead with making the gavvalu. Make the dough into small balls, like how we make for vella seedai. Roll this over the gavvalu maker and make the shells. Alternatively, you can use a big fork or a big new comb. Grease the comb before you start making. Make this for the rest of the dough. Heat oil and once it is hot, keep the flame low. Gently drop the shells into the oil. Fry this in low flame till it becomes golden brown and crisp. Take out from oil and drain excess oil in a kitchen towel. Let's make the sugar syrup. Add sugar in a saucepan and add 2 tblsp of water. Let the sugar dissolve completely and boil in a low flame till you get 2 string consistency. When you take a drop of sugar syrup in your fingers, and hold between your index and thumb finger, it should form 2 strings. Add the fried gavvalus into the sugar syrup and mix it up nicely. Take it out from the syrup and allow this to cool completely by spreading it into a plate. Once done, separate them and store this in an airtight container. If using jaggery, boil the syrup until you get a soft ball consistency. When you put few drops of jaggery syrup into the water and gather it, it should form a soft ball. If you want, you can add a pinch of cardamom powder to the syrup to enhance the flavour. Always fry them in a low flame. Else it will not come out crisp. You can try this with wheat flour too, but make a thick dough and cook for a long time in low flame. This sweet gavvalus stay crisp for more than 15 days. I also have this recipe in queue to write.